A ModalStructuralResults object contains the natural frequencies and modal displacement in a form convenient for plotting and postprocessing. Modal displacement is reported for the nodes of the triangular or tetrahedral mesh generated by generateMesh. The modal displacement values at the nodes appear as a structure array in the ModeShapes property. The fields of the structure array contain the components of the displacement at the nodal locations. You can use a ModalStructuralResults object to approximate solutions for transient dynamics problems. For details, see solve. Solve a modal analysis problem by using the solve function. This function returns a modal structural solution as a ModalStructuralResults object. Natural frequencies of the structure, returned as a column vector. Modal displacement values at the nodes, returned as a structure array. The fields of the structure array contain components of modal displacement at nodal locations. Finite element mesh, returned as a FEMesh object. For details, see FEMesh Properties. Find the fundamental (lowest) mode of a 2-D cantilevered beam, assuming a prevalence of the plane-stress condition. Specify the following geometric and structural properties of the beam, along with a unit plane-stress thickness. Create a model plane-stress model, assign a geometry, and generate a mesh. Define a maximum element size (five elements through the beam thickness). Specify the structural properties and boundary constraints. Compute the analytical fundamental frequency (Hz) using the beam theory. 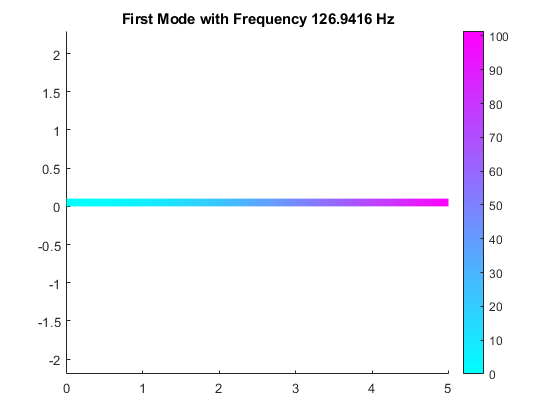 Specify a frequency range that includes an analytically computed frequency and solve the model. The solver finds natural frequencies and modal displacement values at nodal locations. To access these values, use modalresults.NaturalFrequencies and modalresults.ModeShapes. Plot the y-component of the solution for the fundamental frequency.